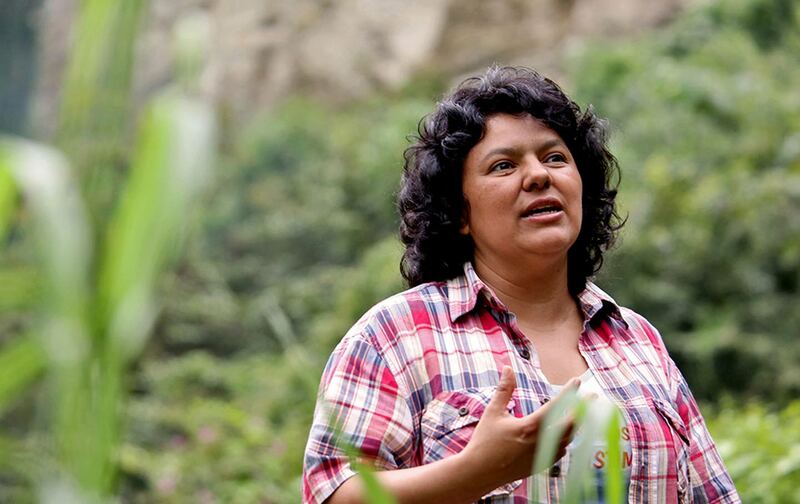 The names of Berta Cáceres’s murderers are yet unknown. But we know who killed her. Hillary Clinton will be good for women. Ask Berta Cáceres. But you can’t. She’s dead. Gunned down yesterday, March 2, at midnight, in her hometown of La Esperanza, Intibuca, in Honduras. Cáceres was a vocal and brave indigenous leader, an opponent of the 2009 Honduran coup that Hillary Clinton, as secretary of state, made possible. In The Nation, Dana Frank and I covered that coup as it unfolded. Later, as Clinton’s emails were released, others, such as Robert Naiman, Mark Weisbrot, and Alex Main, revealed the central role she played in undercutting Manuel Zelaya, the deposed president, and undercutting the opposition movement demanding his restoration. In so doing, Clinton allied with the worst sectors of Honduran society. Despite the fact that he was a rural patriarch, Zelaya as president was remarkably supportive of “intersectionality” (that is, a left politics not reducible to class or political economy): He tried to make the morning-after pill legal. (After Zelaya’s ouster, Honduras’s coup congress—the one legitimated by Hillary Clinton—passed an “absolute ban on emergency contraception,” criminalizing “the sale, distribution, and use of the ‘morning-after pill’—imposing punishment for offenders equal to that of obtaining or performing an abortion, which in Honduras is completely restricted.”) He supported gay and transgender rights. (Read this. Among the first to be murdered was Vicky Hernandez Castillo, a transgendered activist in San Pedro Sula. Hernandez left her home on the night of the coup, apparently unaware that the new government had decreed a curfew. She was found dead the next morning, shot in the eye and strangled; Sentidog, an LGBT monitoring group, writes that 168 LGBT people were killed in Honduras between the coup and 2014.) Zelaya apologized for a policy of “social cleansing”—that is, the murder and disappearance of street children and gang members—executed by his predecessors. And he backed rural peasant and indigenous movements, such as the one Cáceres led, in the fight against land dispossession, mining, and biofuels. Zelaya, as president, was by no means perfect. But he was slowly trying to use the power of the state on behalf of the best people in Honduras, including Berta Cáceres. Such is the nature of the “unity government” Clinton helped institutionalize. In her book, Hard Choices, Clinton holds up her Honduran settlement as a proud example of her trademark clear-eyed, “pragmatic” foreign policy approach. Since the 2009 coup, Honduras has witnessed an explosive growth in environmentally destructive megaprojects that would displace indigenous communities. Almost 30 percent of the country’s land was earmarked for mining concessions, creating a demand for cheap energy to power future mining operations. To meet this need, the government approved hundreds of dam projects around the country, privatizing rivers, land, and uprooting communities. Among them was the Agua Zarca Dam, a joint project of Honduran company Desarrollos Energéticos SA (DESA) and Chinese state-owned Sinohydro, the world’s largest dam developer. Agua Zarca, slated for construction on the sacred Gualcarque River, was pushed through without consulting the indigenous Lenca people—a violation of international treaties governing indigenous peoples’ rights. The dam would cut off the supply of water, food and medicine for hundreds of Lenca people and violate their right to sustainably manage and live off their land. Berta Cáceres, a Lenca woman, grew up during the violence that swept through Central America in the 1980s. Her mother, a midwife and social activist, took in and cared for refugees from El Salvador, teaching her young children the value of standing up for disenfranchised people. Cáceres grew up to become a student activist and in 1993, she co-founded the National Council of Popular and Indigenous Organizations of Honduras (COPINH) to address the growing threats posed to Lenca communities by illegal logging, fight for their territorial rights and improve their livelihoods. In 2006, community members from Rio Blanco came to COPINH asking for help. They had witnessed an influx of machinery and construction equipment coming into their town. They had no idea what the construction was for or who was behind the project. What they knew was that an aggression against the river—a place of spiritual importance to the Lenca people—was an act against the community, its free will, and its autonomy. The names of Cáceres’s murderers are yet unknown. But we know who killed her. I’m tempted to end this post with a call on Bernie bros and sisters to hold Hillary Clinton responsible and to ask, when possible in town halls and meet and greets, if she ever met Cáceres, or if she is still proud of the hell she helped routinize in Honduras. But, really, Cáceres’s assassination shouldn’t be reduced to the idiocy of American electoral politics. All people of goodwill should ask Hillary Clinton those questions.